Amesbury is a bit off our beaten path, but we recently met up with some of our favorite local food bloggers for dinner, and it proved a great gathering location. We decided to check out Phat Cats Bistro on Market Street and were in very good company with Jane of Food and Fiction, Laura of The Two Palaverers and Mary of Cooking 4 the Week whom we thank for some of the photos. Phat Cats has been open for almost three years now and is run by husband and wife chefs Christina Johnson and Paul Eastman. They locally source as much of the produce and seafood they can, dependant on the season. The dining room is casual and comfortable, with warm tones, exposed brick, several chalkboards sporting specials, and a full bar along one wall. The cocktail list was fun, the wine list included some great picks, and our drinks were generously poured. We started with several appetizers to share. The lobster rangoon was appealing, but the texture was unexpected. The filling was more liquid than traditional rangoons, and the tubular shape of the pastry made them a bit splurty ($9). 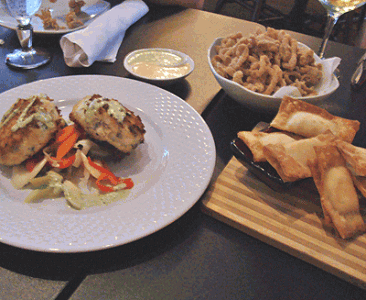 The calamari was crisp and flavorful, accented nicely by the chipotle dipping sauce ($8). The haddock cake was light, moist, and savory ($8). The entrées are varied, and several are offered as full or half portions. The seafood crepe was a surprise, as we envisioned a French style crepe with a cream sauce, but it was more Southwestern, with fresh corn, tomatoes, and spinach surrounding large bits of lobster and scallops. It was served with a bruleed savory corn pudding that was lovely ($16/22). The bistro steak, an herb crusted hangar steak ($18), was very tasty, and the surf and turf risotto (tenderloin beef tips and wild shrimp served over caramelized onion sausage risotto) was wonderfully complex and the favorite at the table ($24). The veal saltimbocca special ($19) and the herb gnocchi gratin ($11/16) were less successful. Although obviously prepared with care from quality ingredients, the final product somehow lacked zip. Most of us were too sated for dessert, but we did try the homemade coconut pudding accompanied by a brownie. Both were excellent, the pudding rich and lightly sweet. While not every entrée was spectacular, we enjoyed our visit overall, aided by the friendly, helpful staff and the unique flavor combinations on the menu.